Only one missing = Rad Onc, but I suppose that's understandable since I can't really figure out who goes into that myself. Really huge nerds with outstanding grades who want to work normal hours and still make 300K per year, who don't enjoy inpatient medicine / anything remotely emergent? 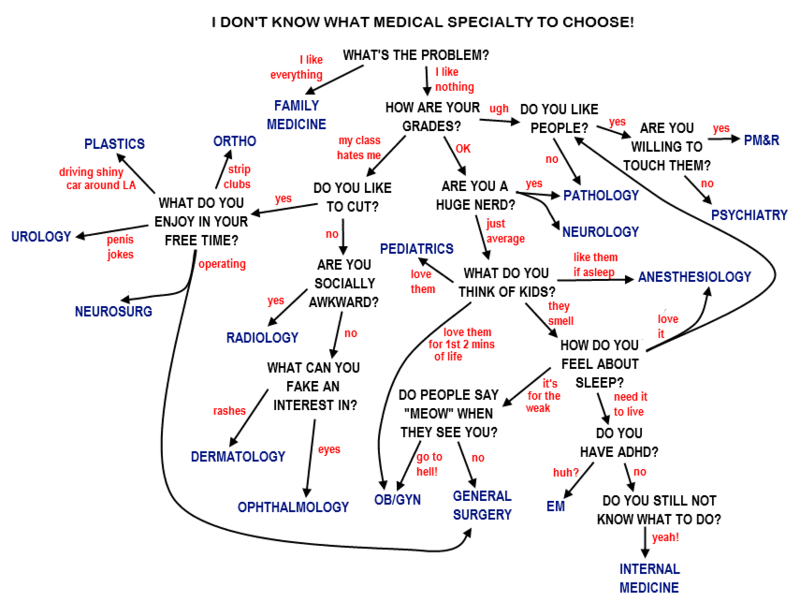 Bwahaha, so according to this I should do Paeds or Internal, which is what I would love to do, but in South Africa they're two of the most competitive specialties - more so than derms or ophthal. Luckily I still have time to decide. Lots of time. Hey, no love for Genetics? Nice to we my preference for family med confirmed. We'll see how that goes, though. Could you explain the "Do people say "meow" when they see you?" Maybe it's just so obvious I don't see it. Translation: "Are you a catty B*tch?" Love it!! Although my route to pediatrics was more of an offshoot of the route to Family Medicine. I thought I liked everything, but then discovered that kids (on average) smelled better than adults and didn't cough up horrible phlegm nearly so often as adults. It's all about what triggers the doctor's gag reflex! Well this was better than I expected. No dry writing and the handwriting is very legible! I'm going to share this because it's so good. I hate everything and I still ended up in Family Medicine! 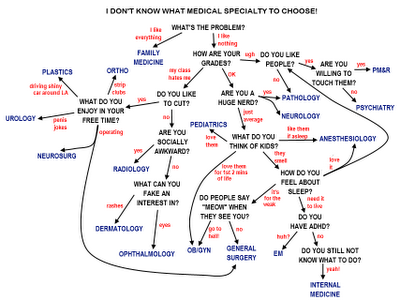 Great flow chart! Haha thanks for posting this! I know it's just a joke, but I can see this being strangely beneficial to anyone who doesn't exactly know what they want to do with their degree. Thanks for the laugh and, oddly enough, for the insight. OK, I had to laugh out loud. I do have ADHD and EM is EXACTLY the thing that appeals to me! So good! Hilarious! I'm in EM now but I need sleep to live and actually, I'm at high risk for ADHD :P However, I do like everything and my class hates my grades. Ob/Gyn lets you cut too!